Stress is a physical response of the body to events and situations that are threatening or upsetting. During dangerous or alarming times, the body's defenses kick into high gear in a rapid, automatic process known as the “fight-or-flight” reaction, or the stress response. Stress response is a defensive mechanism designed to protect. It helps the person stay focused, energetic, and alert during critical moments and emergency situations. Based on recent studies, scientists now have a better understanding of the way that stress impacts the brain. New research, published by Cell Press in the January 26 issue of the journal Neuron, reveals pioneering evidence for a new mechanism of stress adaptation and may eventually lead to a better understanding of why prolonged and repeated exposure to stress can lead to anxiety disorders and depression. Most stressful stimuli cause the release of corticotropin-releasing hormone (CRH) from neurons in the brain. This is typically followed by rapid changes in CRH gene expression. In more practical terms, as soon as the CRH-containing neurons run out of CRH, they are already receiving directions to make more. 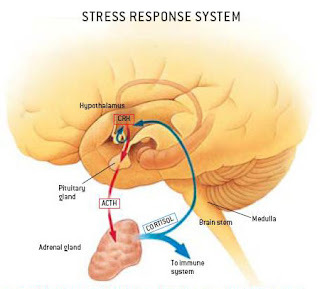 CRH controls various reactions to stress, including immediate "fight-or-flight" responses as well as more delayed adaptive responses in the brain. Regulation of CRH activity is critical for adaptation to stress, and abnormal regulation of CRH is linked with multiple human psychiatric disorders. "Despite the wealth of information regarding the physiological role of CRH in mediating the response to stress, the molecular mechanisms that regulate expression of the CRH gene, and thereby CRH synthesis, have remained largely elusive," explains senior study author, Dr. Gil Levkowitz, from the Weizmann Institute of Science in Israel. "In our study, we used mouse and zebrafish model systems to identify a novel intracellular signaling pathway that controls stress-induced CRH gene expression." Dr. Levkowitz and colleagues discovered that the protein Orthopedia (Otp), which is expressed in parts of the brain associated with stress adaptation, modulated CRH gene expression and was required for stress adaptation. The researchers went on to show that Otp regulates production of two different receptors on the neurons' surface. The receptors, which receive and relay CRH production instructions, essentially function as "ON" and "OFF" switches. "This regulation of the CRH gene is critical for neuronal adaptation to stress. Failure to activate or terminate the CRH response can lead to chronic over- or under-activation of stress-related brain circuits, leading to pathological conditions," concludes Dr. Levkowitz. "Taken together, our findings identify an evolutionarily conserved biochemical pathway that modulates adaptation to stress."